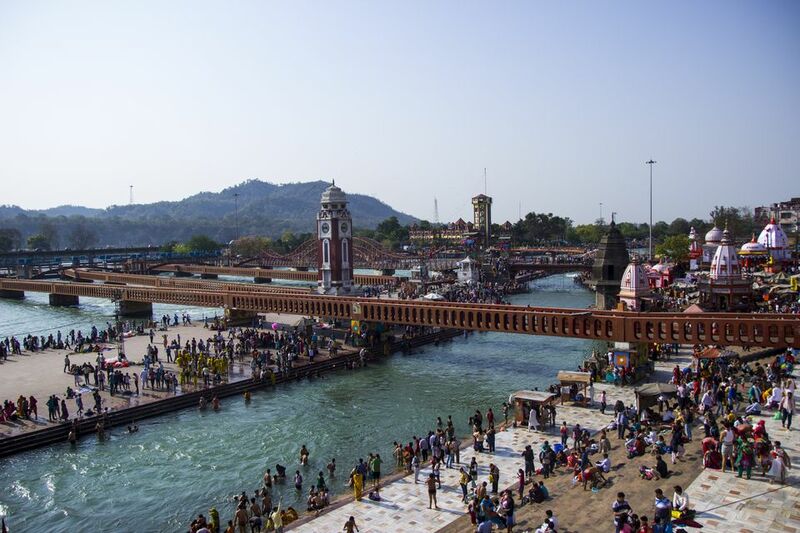 Haridwar hotels in India are all about location, location! There are plenty of options but you'll want to stay somewhere near the Ganga River to really enjoy and appreciate Haridwar. When choosing your accommodations, keep in mind that most hotels are situated in three main areas: along the river, on the main road near the railway station and bus stand, and on the outskirts of town along the Haridwar-Rishikesh Highway (you'll find most of the more upmarket hotels there). Here are the best riverside picks for all budgets, including some noteworthy heritage properties. The Haveli Hari Ganga hotel is worth splurging on and is easily the top choice for staying in Haridwar. This tastefully renovated 90-year-old mansion, originally built by the Maharaja of Philbirt, sits on the river bank about 10 minutes walk south of Hari-ki-Pauri ghat (where the evening Ganga Aarti takes place). It has 20 rooms, and its own private ghat and terrace overlooking the river. At night, there's live music in the courtyard. The hotel also has a spa and offers yoga packages. Rates: From about 8,700 rupees per night, including tax and buffet breakfast. The Ganga Lahari is part of the same group as the Hotel Haveli Ganga, although it's not quite as atmospheric. What this intimate boutique heritage hotel does have in its favor is a prominent position on the banks of the Ganga, very close to Hari-ki-Pauri ghat. Apart from the fact that it's located in the heart of the action, its other attractive feature is that all of its 16 rooms overlook the river. The hotel has a regal history -- it was built over 100 years ago by the Maharaja of Tehari Gharwal. It's since been beautifully renovated. Rates: From about 8,700 rupees per night, including tax an breakfast. Devnadi is a 150 year-old heritage hotel that opened in its current form in 2016. Before that, it operated as the Sagar Ganga Resort, owned by revered Indian film director and producer Ramanand Sagar. He's best known for making the Ramayan television series, and apparently, some of it was written in the hotel's magnificent Ganga Sagar Suite. While the hotel looks unremarkable from the outside, it's been beautifully restored on the inside and turned into a peaceful spiritual retreat with just eight guest rooms. Yoga sessions are conducted in the mornings, as well as morning and evening aarti ceremonies. The hotel also has a temple and one of the largest private ghats in Haridwar. Its restaurant serves fresh and healthy food, and hospitality is outstanding. The only drawback is that the location is a 30-minute walk from Hari-ki-Pauri ghat. However, it's situated on a quiet side street fronting the river. Rates: From about 4,000 rupees per night, including tax and breakfast. If you're looking for a decent mid-range riverside hotel and don't mind being a 20-minute walk from Hari-ki-Pauri, Ganga Sadan fits the criteria. The hotel was renovated in 2014 and has 39 rooms (some face the river and have private balconies), large private ghat, and restaurant that serves global cuisine. It also offers adventure activities, spiritual tours, yoga and photography workshops. Rates: From 5,000 rupees per night, including breakfast and dinner. The most appealing thing about Hotel Teerth is its location, on the riverside only a few minutes walk south of Hari-ki-Pauri. All 36 rooms are river-facing and have balconies, and the aarti can even be seen from some of them. Part of the hotel recently had much-needed spruce up. Rooms are simple but clean and comfortable enough and have air conditioning. The hotel also has a restaurant. It's an excellent choice if you don't want to pay too much to stay in the area. Rates: From 2,600 rupees for a double room, plus tax. Family suites cost 3,400 rupees per night. Book early because it's very popular! Located in a heritage building by the river, homely Brij Lodge is only 100 meters north of Hari-ki-Pauri. It's a budget hotel with basic accommodations and facilities. There's a wide range of rooms to choose from, and the best ones open out on to terraces or private balconies that provide fabulous views. In contrast, the cheapest standard rooms are situated on the lowest floor and are rather small and airless. Do choose wisely to avoid being disappointed! The lack of lifts in the hotel may also be an issue for the elderly if they find the stairs difficult to climb. In addition, there's no restaurant on the premises. Rates: From 800 rupees per night for a standard room without air-conditioning, and go up to 1,300 rupees per night for a superior family room with air-conditioning. Tax is additional. Hotel Aditya is another good budget choice by the Ganga River, although it's located at Vishnu Ghat about 15 minutes walk from Hari-ki-Pauri. The hotel has two interconnected blocks -- one faces the market and the other faces the river. There are 40 rooms spread over various categories. The river-facing rooms (make sure you stay in one) all have huge windows and balconies. The hotel also has its own private bathing ghat and a small kitchen that serves meals to guests. The staff is courteous and happy to provide assistance to guests. Rates: From 1,350 rupees per night for a room on the ground level. If you can afford it, it's worth paying extra for a brightly painted deluxe or suite room on an upper floor. Discounts are available during the low season.